Having not done any work on the layout for a week or two, due to holidays etc, we did finally manage to return to the Engine Shed at the weekend and continued working in the town area but there will be more on this in my next posting. 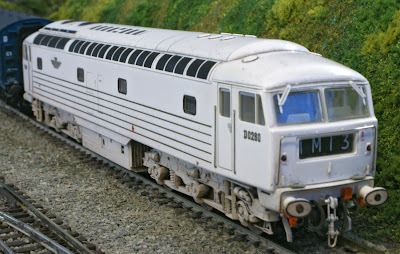 What we have done during the past couple of weeks is to have three more of our locos lightly weathered by Alex at Mikron Models. As I think I mentioned when we acquired Lion, we were delighted with the overall look of the model but had reservations about certain aspects, not least the plasticky-looking bogies. Well, I must say, now that the loco has been weathered, with the request made to tame the bogies and underframe, I think she looks superb! In fact I would say that the weathering has actually highlighted the detail and made it stand out much more clearly. We put her to work again on the layout at the weekend and, now, she looks and sounds just great! The plan is to upload a video to YouTube next weekend which will feature the newly-weathered trio plus the latest addition to our fleet, of which, again, more later!